Younger: Directional Body Taps for Follow, then Silent Video of I Know. Older: Body Rhythm Pattern with extender activity for Follow/Adam, then Silent Video to give visual images to the children of I Know. Younger: Sway and Freeze for I Know with a change up on the chorus, then Role Play for Follow/Adam (using a story for teaching about being taught by an angel). Older: Patsch Cross Pattern for I Know, then Role Play for Follow/Adam (using the scripture for the angel teaching Adam). Younger: Simplified Rhythm Band for Follow/Noah, then the Three Piece Puzzle activity for the 1st verse of I Know. Older: Rhythm Band for Follow/Noah, then Envelope Game for the 2nd verse of I Know. Younger: Partner Scarves for I Know 1st verse, and Draw the Song for Follow/Noah. Older: Egg Shaker Pass for I Know 2nd verse, and Crack the Code for Follow/Noah. There is a contrast each week between the activities for the two songs. One activity will appeal mainly to a certain intelligence, and the contrasting activity appeals to a different intelligence. Sometimes one of the songs comes first, and sometimes the other song comes first. It depends on the activity. I want an activity that will draw the children in to go first. 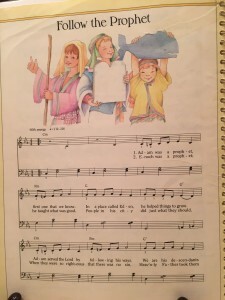 The older children begin to learn the second verse of I Know That My Savior Loves Me because they already are so familiar with the first verse from last year. (If your children don’t know the first verse well, stay with the first verse for these different activities.) 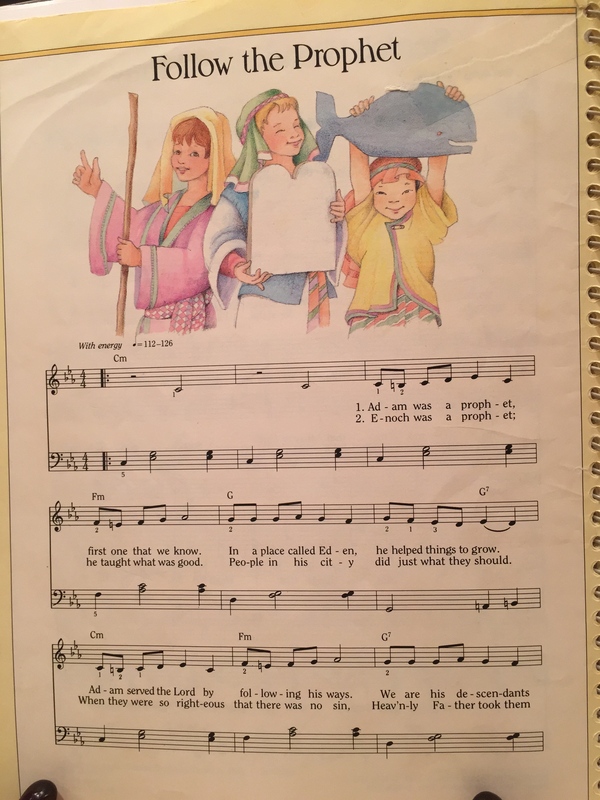 The younger children are still learning the 1st verse because of the three and four year olds that need to hear it again and again. There is something intriguing every Sunday, but it is not entertainment. Each activity has a challenge for the children. Each activity is trying to stay true to the feel of each particular song being taught. I hope this gives you an outline of what I’m trying to do for January. Thank you so much for sharing these ideas. The outline is immensely helpful. One question: Are you singing just two songs in singing time then? I’ve been doing 3 songs per singing time (dividing my time as 5 minutes, 10 minutes and 5 minutes), but I like the simplicity of two. I usually do two and sometimes three songs depending on the extenders that I do with the activities (and how much time I actually get to teach). An extender is almost like doing a whole different activity, yet still focusing on the same song. The key is to keep a challenge that the children are trying to accomplish (thus the extenders). Staying too long on one song doesn’t make for a good flow or good contrast, so you have to balance that. With the younger children, I always do two “warm up” wiggle songs (like Oh How We Love to Stand.. which I like all three verses, or My hands upon my head I place.. which helps the children with knowing where their body is in space. That age so needs that.) I then will head to the two or three focus songs. I keep the length of the activity for each song shorter for that age so that the younger children can take them in fully. They actually need more repetition with space in between than the older children, so I will do a short activity more weeks in a row than I would for the older children. Thank you for clarifying, this was my question too. I LOVE your methods! I have wanted to “challenge” myself to focus more on singing and less of talking through singing time! Games can be so fun but I found myself feeling sad at the end of singing time because I would spend so much time explaining what we were doing and NOT singing;(. The children have responded so well to your approach! Actually, our first counselor in the stake presidency observed last week and shared some very kind thoughts about your approach!!! Anyway-when will you be posting details about your rhythm band? I like to practice (some of your ideas are a little challenging for me at age 50+). I’m hoping to do it at a ward conference on Sunday and I like to prepare so that i feel comfortable. Thanks so much for sharing your knowledge and inspiration! Melanie, I got the post up this morning. If you have any questions, let me know. Explaining it took much longer than I thought! I really appreciate your site!! New to this calling and I feel I am gonna love it, but am overwhelmed at how to teach. I feel that you must be an entertainer and I am not. So I appreciate your words and ideas. My question is how to accommodate both younger and older primaries when they are together? Our singing time is together and I struggle with how to challenge the older and yet keep the attention and include the younger. We currently have them sit as buddies an older and younger child to help with reverance etc. How can I utilize that? Sorry for my bombardment of questions. When we do an activity with older and younger together, I ask the older children to find a younger child and do the activity with them. Because of the older child, I can do more complex activities than just younger children alone (although not quite up to the older child level that you read in this blog). For instance, if you do the rhythm band activity I just posted, both the younger and the older child need the same instrument so the older can lead the younger. If you do sway and freeze (which is too young for older), you ask the older to make sure the younger child is pointing his hands just the right way. If you do Crack the Code (an older logic and reading activity), you have the younger children color a picture about the song while the older children figure out the code. I would love more questions about this “harder” way to do singing time. It is possible to reach both groups, but you have to constantly be aware of engaging each of the different ages. May I ask what directional body taps are. I was a chorister many years ago and have been recalled. I have never heard of this, but it sounds interesting! Hello, I’m a brand-new, terrified chorister and was thrilled to find your site. I love your emphasis on engaging teaching methods that are not just entertainment. Where can I find instructions for the Three Piece Puzzle activity? Thank you! Thank you so much for sharing your understanding ad knowledge. I went to a Stake training in which some of your method and philosophies were shared and it has really brought our singing time to a new level. Especially the idea that we should try to have every child participating in every activity as often as possible. With the guidelines and tips provided by the church in the outline, the Spirit, and your suggestions, I am so excited for the kids (and adults) to feel the impact of music and their teatimonies to grow. I have been in Primary Chorister Heaven since purchasing your book and finding this site. Thank You! THANK YOU! Thank you Joy for reaching out. I appreciate it. I so appreciate the connection with you!